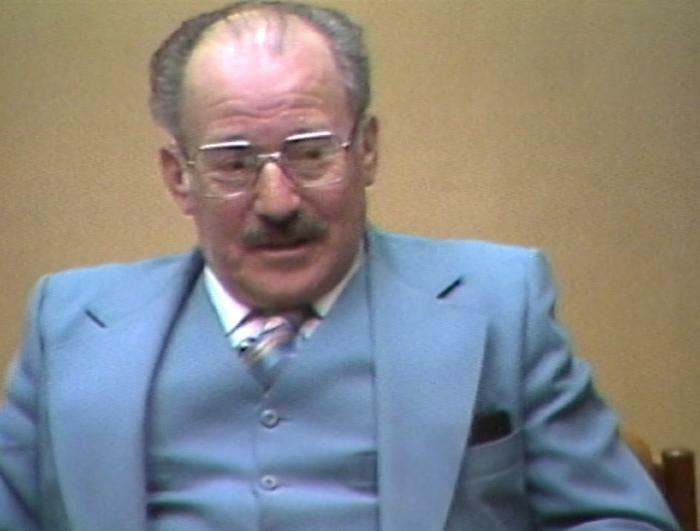 Still image from Chaim K. Holocaust testimony, February 29, 1984. SynopsisChaim K. was born in Sátoraljaújhely, Hungary on December 10, 1926. He was the youngest of eight children and describes his family. He recalls his family’s poverty. He describes his early education and experiences of antisemitism. He recalls his brothers being forced into labour brigades. Chaim describes the German occupation of Hungary in March of 1944 and ghettoization. He recalls deportation, arrival at Auschwitz, and separation from his family. Chaim was transferred to Mauthausen for four days and then taken to Gusen camp to perform slave labour. He describes receiving assistance from German officers. Chaim recalls the illness he experienced. He describes surviving the death march to Mauthausen with assistance from a friend. He recalls liberation by United States troops in May of 1945. He describes returning to Gusen and recovering in the rehabilitation centre. Chaim discusses searching for his family via Vienna to Budapest to return home, where he reunited with his sister. He recalls the support of the Jewish community and returning to school. He recalls immigrating to Israel in 1948, establishing a kibbutz, and joining the military. Chaim discusses joining his brother in Montreal, finding employment, meeting his wife, and moving to Vancouver. He discusses sharing his experience with his children.